Menopause is a natural transition in every woman’s life. It is not really an illness or disease but the most problematic part of this transition is the symptoms associated with menopause. The symptoms include night sweats, vaginal dryness, low libido, mood swings, anxiety, physical exhaustion and the much dreaded hot flashes. There are many treatment options like hormone replacement therapy (HRT) using estrogen and progesterone injections or pills. However, HRT is not a viable option for most people because of its negative effects on the health of most women. One of the most popular treatment options today is the use of menopause relief supplements. These are usually all-natural products made from herbal extracts and other natural substances and compounds that are proven to be effective in addressing the different symptoms of menopause. 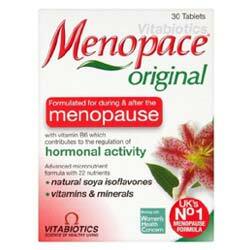 In this article, we will take a closer look at a menopause relief supplement from well-known company Metagenics. The company is well-regarded in the supplement industry for their line of dietary supplements. The product is called Estrovera Menopause Relief which is an all-natural supplement. 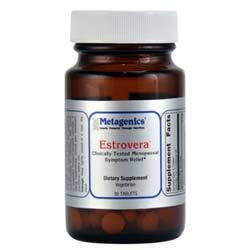 Estrovera Menopause Relief takes a natural approach for providing relief to hot flashes and other symptoms of menopause. It contains a special from of phytoestrogen extract derived from Siberian rhubarb. The extract is called ERr 731 which is clinically studied and found to be effective in reducing menopausal symptoms. Thus, it is an effective and safe natural treatment option for both perimenopausal and postmenopausal women. This is the only key ingredient but it is backed by several clinical studies posted on the product’s website. Estrovera Menopause Relief essentially works like hormone replacement therapy (HRT). It contains a natural form of estrogen (phytoestrogen) to help normalize the low level of the hormone which is the main cause of the symptoms of menopause. The product has been clinically demonstrated to provide relief to a variety of menopausal symptoms especially the much dreaded hot flashes. The product claims to work within 4 weeks of use but full effectiveness takes about 3 months according to the manufacturer. The product is all-natural and doesn’t contain chemicals or other harsh ingredients. Estrovera Menopause Relief has an excellent website that contains detailed information on the product and the clinical studies proving its effectiveness and safety. Clinically tested for effectiveness and safety. There are no known side effects from taking this menopause relief supplement. There are many good reviews and feedback on this product saying it really works. Estrovera Menopause Relief is not available in many health retail stores and supermarkets. There is some negative customer feedback saying the product takes a long time to work and some say that the effects are not really considerable. It only contains one active ingredient. It is contraindicated for individuals with any kind of estrogen-dependent cancer. Cannot be used with certain medication so you need to consult your doctor if you are taking any kind of prescription medication. Estrovera Menopause Relief is a good product from a reputable company. The highlight of this menopause relief product is the money-back guarantee which is testament to the product’s safety and effectiveness. This is a recommendable product if you’re looking for a natural option for menopause relief. My doctor recommended these for hot flashes and I did notice a difference. it didn’t completely stop them. I had intense hot flashes. You need to take it every day with proper meals to see the difference.